Want to Build a Smoker out of a Propane tank? Well I can help you with that! This site is a great place to learn what you need and how to build a smoker out of a propane tank. If you don’t have a propane tank already, I can even help you find one if you live in the Midwest and and want to pick it up. 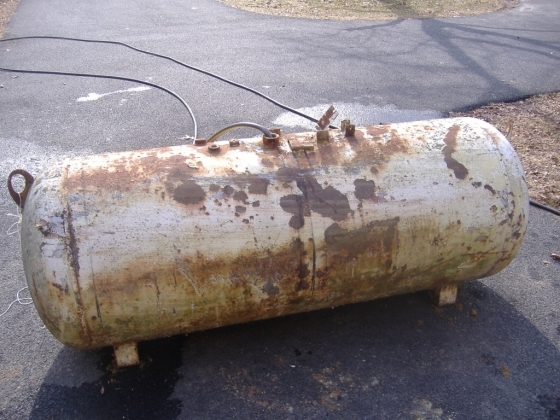 A great place to start looking for a propane tank would be a local classifieds website or publication. If the tank does not have propane in it you can load it on a trailer and haul it off just fine. If it does then you will need to have the propane evacuated before transport. rlmax02's propane tank. He is using it for his "king cooker" reverse flow smoker build. Propane tanks are great for Building a Smoker because the steel they are made from is usually a quarter of an inch thick or more. This makes it easier for cutting doors out without them warping and they last forever. The best Smoker to build out of a Propane Tank is a Reverse Flow Smoker. I recommend a 250 or 300 gallon Propane Tank for the average smoker build. Propane Tanks can be found as large as 500 and 1000 gallons for large smoker builds. When flushing out the tank make sure to get ALL the air out of the tank. Most flammable liquids are lighter than water so they will float on top of the water and be forced out. Dawn dish washing soap contains Surfactants which break the surface tension of the water to allow it to flow into tiny crevices to aid in cleaning out tight spaces. TSP helps to breakdown and remove oily substances.TSP can be purchased from Lowe’s or other paint suppliers. I have purchased it in it’s powder form. The best mixture is 2pounds per 100 gallons of water. After soaking the inside of the tank with this mixture, dump the contents of the tank and fill with water again. Let the water continue to run and overflow for at least an hour and agitate the tank if possible to help remove any air pockets. Before cutting the tank open, dump out the water and purge the tank with argon or carbon dioxide. Leave as many holes open in the tank as possible as to not pressurize the tank. Also make sure the container or vessel is not pressurized and you are in a well ventilated area. Make sure the container or vessel has all threaded or bolted ports opened up and inert gas is purged into the container or vessel to remove all oxygen. Argon works well for this. When preparing to cut open any container that you are unsure is safe, always seek advise from an expert. You can ask any such safety questions in our forums and if we don’t know the answer already, we can help you find it. Sign up for the forums and ask all your questions and get expert advice! ← How to Build a UDS Smoker DVD!